The finding completely changes scientists' understanding of Native Americans. A surprising new study has found that salmon fishing is a lot older than anyone had thought. Researchers have found the remains of salmon at a cooking hearth in Alaska that is estimated to be 11,500 years old — back during the last Ice Age — and it is atop a grave where two infants were buried, according to a New York Times report. It’s the earliest confirmed evidence that natives consumed salmon in North America — before, researchers had no idea that Paleo-Indians were eating salmon or any other type of fish, as all the other bones they had found were of other animals found on land. The findings were published in the journal Proceedings of the National Academy of Sciences. A total of 300 salmon bone fragments were found at the site. Dr. Ben Potter, a study author and an archaeologist at the University of Alaska Fairbanks, was quoted in the report as saying he was “very excited to get this first evidence,” and that the key now is to find out just how much of a factor salmon or other fish were in early Native Americans’ diets. For example, at this point it seems likely that salmon made up only a small part of their diet, and they usually caught them with some type of net when they could. In addition to the salmon, there were some other interesting finds at the site. Paleo-Indians also apparently ate ground squirrels and hares, perhaps less surprising as they must have been plentiful at the time. It may have once been nothing more than occasional delicacy to Indians way back when, but today the salmon is of course a staple of diets in Alaska, and has become a popular fish worldwide for its generous amount of meat and delicious flavor. It is a relatively expensive fish because of this compared to other species like tilapia and trout. Salmon are native to the North Atlantic, particularly tributaries, as well as the Pacific Ocean, and they are quite well known in Alaska as being a spectacular sight during spawning season, leaping up waterfalls as they had upstream to their spawning grounds. Herds of grizzly bears can be seen attempting to catch them for a quick meal in what is one of the defining images of the Alaskan wilderness. As a result, it’s not surprising that Native Americans at some point attempted to eat them after relying on land animals for so long, but scientists had not seen any indication that they had made it into the Native Americans’ diet so long ago, until this most recent discovery. It certainly could shed more light on the diet of Native Americans at the time and how they lived back then, as well as what food sources were available to them. Salmon are an interesting species, as they are anadromous — that is, they are born in fresh water, migrate to the salt waters of the ocean, and then return to fresh water to spawn and therefore begin the cycle all over again. Some species are restricted to fresh water their entire lives, however. One interesting fact is that studies have found that these salmon often return to nearly the exact spot where they were spawned, although some returning salmon stray and spawn in other freshwater locations. Today, rather than rely on nets or fishing lures, humans tend to farm salmon in order to ensure a large, fresh, regular crop each year. Salmon aquaculture is a huge industry, amounting to about $10 billion each year. Other farmed fish include, tilapia, catfish, sea bass, and carp. 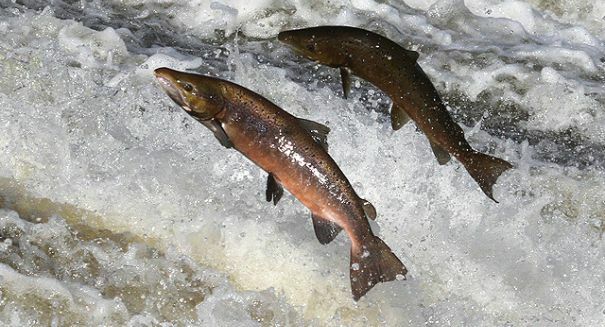 Salmon farming is more common in Chile, Norway, Scotland, and Canada, and these locations provide most of the salmon that is consumed in the United States and Europe.